We’d love your help. Let us know what’s wrong with this preview of Blood Secret by Jaye Ford. However, that illusion of security is broken one night when Max From a master of suspense and author of the bestselling Beyond Fear, Blood Secret is a teasingly crafted, nail-biting thriller that's impossible to put down. To ask other readers questions about Blood Secret, please sign up. Blood Secret is about secrets, greed and the love between two people. Rennie Carter thought that Haven Bay a beauty seashore community would be a place for her to settle down finally. However, this was not the case. Rennie Carter boyfriend Max Tully went missing, and her life was turned upside down again. No one believes Rennie that Max is in danger, not cops or the small community of Haven Bay. Rennie had no one to help her, so she decided to look for Max on her own. The readers of Blood Secret Blood Secret is about secrets, greed and the love between two people. Rennie Carter thought that Haven Bay a beauty seashore community would be a place for her to settle down finally. However, this was not the case. Rennie Carter boyfriend Max Tully went missing, and her life was turned upside down again. No one believes Rennie that Max is in danger, not cops or the small community of Haven Bay. Rennie had no one to help her, so she decided to look for Max on her own. The readers of Blood Secret will continue to follow the twist and turns in Rennie investigation into Max's disappearances. I was recommended to read Jaye Ford books, and I have fallen in love with her books. The way Jaye Ford incorporates her suspense and romance ensure that I will always engage with her books. Blood Secret continues my love affair with Jaye Ford books. I loved Jaye Ford portrayal of her characters and the way they intertwine with each other. Blood Secret was well written and researched by Jaye Ford. I enjoyed Jaye Ford description of her settings that allow me to feel part of the story. The readers of Blood Secret will learn about another side of family violence and how it affects everyone who is involved. Also, the readers of Blood Secret will see what greed and jealousy can do to a person and what they would do to achieve their dreams. Blood Secret opens with a very graphic and palpably tense episode of road rage visited on 30-somethings Max and Rennie as they go to their friend Trish’s birthday party one Saturday night, in the peaceful hamlet of Haven Bay. An angry teenage boy driving a compact 4x4 harasses them, threatening violence. Later that evening Max is seen going out to his car in the carpark, but never returns. Thus Jaye Ford sets up the events of this gripping psychological thriller. When Max fails to return home, Re Blood Secret opens with a very graphic and palpably tense episode of road rage visited on 30-somethings Max and Rennie as they go to their friend Trish’s birthday party one Saturday night, in the peaceful hamlet of Haven Bay. An angry teenage boy driving a compact 4x4 harasses them, threatening violence. Later that evening Max is seen going out to his car in the carpark, but never returns. Thus Jaye Ford sets up the events of this gripping psychological thriller. When Max fails to return home, Rennie searches in vain for him, then decides to report him to the local police as a missing person. We learn gradually, as the narrative progresses, that she has good reason for her fears. I won't say any more because I don't want to spoil it for new readers, but it is an intriguing and all-too-feasible set of suppositions on which this taut story is based. This novel is a really fraught mystery tale. There is surprisingly little action throughout the story until the dramatic climax, and the powerful sense of foreboding builds almost entirely because of the inner tensions and turmoils of the main characters, Rennie, Max and James. Most of the narrative is seen through Rennie’s eyes, and we learn much about how her tragic past now contributes to her thoughts and actions, as she tries to deal with the disappearance of her partner. She has to balance her well-learned knee-jerk urge to flee with her wish to preserve the relationship with Max and the good life she has in Haven Bay. James’s interference does not help her to maintain trust in Max, as she contemplates the possibility that he might, in fact, have run away from her. Rennie’s history unfolds gradually, as the author peels away layers to reveal the sick story at the core of her life. Similarly, Max’s previous life is disclosed slowly, and we learn that there are cogent reasons to suspect him of misdeeds. Only Rennie’s absolute faith in her partner keeps her focussed on finding him and sorting out the mess that they find themselves in. Ultimately this is a story about truth, lies and secrets. It is also a story about keeping faith, belief in oneself and the power of love. It was a real page-turner for me. I was engrossed from the opening pages, and could not put it down until I’d learned the fate of Max and the reasons why his life and Rennie’s turned to nightmare so quickly one pleasant Saturday night in a sleepy NSW town. An absolute five star read for me...I'd give it more if I could. On the night Rennie Carter and Max Tully drove along the beautiful shores of Lake Macquarie toward a friend’s 50th birthday party, the atmosphere in the car was a little tense. But when a teenage driver cut them off at a roundabout then tailgated them to the bottle shop and restaurant, tensions escalated alarmingly. The road rage incident was so over the top, if it hadn’t been so scary the attitude of the young driver would have been laughable. So when they finally stepped inside and joined thei On the night Rennie Carter and Max Tully drove along the beautiful shores of Lake Macquarie toward a friend’s 50th birthday party, the atmosphere in the car was a little tense. But when a teenage driver cut them off at a roundabout then tailgated them to the bottle shop and restaurant, tensions escalated alarmingly. The road rage incident was so over the top, if it hadn’t been so scary the attitude of the young driver would have been laughable. So when they finally stepped inside and joined their friends, Rennie breathed a jagged sigh of relief. Working in the kitchen, circulating amongst her friends, Rennie only spotted Max a couple of times during the course of the evening; but when she went to find him to head home, no-one had seen him for at least an hour. Someone said he’d gone out to check on the car - Max had disappeared; all their searching of surrounding bush and parkland found nothing. Finally, having nowhere else to turn, they called the police…. As the hours passed by, the questions mounted; Rennie seemed to be the only one concerned about Max. Suddenly rumours began circulating about him; horrible rumours Rennie knew couldn’t possibly be true – could they? Max’s cousin and business partner plus the police were just so off base, she knew she’d have to search herself. But with her past one she couldn’t and didn’t talk about, was the danger coming from another direction entirely? The secrets from her past seemed set to collide with the secrets from Max’s…. Suddenly danger, violence and horror were all around her! What was going on? Would she find Max before it was too late? Or was it finally too late for Rennie? I absolutely loved this third book by Jaye Ford. I’ve been waiting anxiously for the release, and it certainly didn’t disappoint! The setting is in beautiful Lake Macquarie where I live, and the descriptions of the landscapes and small lakeside villages is so true to life, I could easily visualize where events were happening. The pace was fast, racing from one gripping happening to the next, I just found I was unable to put it down. A fantastic psychological thriller by an author who is definitely a master at her game! Highly recommended. Jaye Ford follows the success of Beyond Fear and Scared Yet? with her third exciting psychological thriller, Blood Secret. Rennie Carter never expected to stay long in the sleepy Australian coastal community of Haven Bay, but then she met Max Tully, and after a lifetime of running she dared to hope she finally found somewhere she could stay, somewhere she could be safe. And then one night Max disappears without a trace and Rennie is terrified her past has finally caught up with her - but Rennie is not the only one with secrets. Tension is introduced in the first pages of this novel and Ford continues to build the suspense until the books final frenzied moments. I was never completely sure who to hold responsible for Max's disappearance, which is testament to Ford's skillful and subtle plotting. The road rager, the father, the brother-in-law, the cafe owner, and even Max himself, are all credible suspects in his disappearance, though ultimately my first instinct proved correct. One of the things I particularly admire about Ford's characters is the way they make reasonable decisions based on the information and skills they have, instead of throwing themselves into the path of danger by making inane choices. Rennie, for example, reports Max's disappearance to the police, and when she suspects her father's involvement she reaches out to confirm or discredit her theory. Trust is not easy for Rennie, whose past is littered with tragedy, but Rennie doesn't dismiss her instincts about situations and people and it is that which ultimately saves her...and Max. This is an excellent book. The story is gripping and well written. I loved seeing a really strong female lead character who actually made genuine life saving decisions instead of blundering into silly situations in order to help the author write a story. It was enjoyable too that the book was set locally in an area which I know well! I will certainly read more by this author. Blood Secret by Jaye Ford is a little bit like bolting down the Freeway at a 110k an hour only to realise you have been going the wrong way all along! You think you have the story sussed, and can see the destination, but you don’t. Cleverly written, this book lays out the main characters, a couple called Rennie and Max who are in love but both have and hide secrets. Big secrets held by them both and their tightknit group of friends in little Haven Bay on the NSW coast. Rennie is a hard woman, but Blood Secret by Jaye Ford is a little bit like bolting down the Freeway at a 110k an hour only to realise you have been going the wrong way all along! You think you have the story sussed, and can see the destination, but you don’t. Rennie is a hard woman, but street smart and hard working which makes you like her, I won’t reveal a spoiler but when you learn of her extremely violent past you instantly root for her and want her ‘to be ok in the end’. The characters are so tightly bound together you feel like you know them and I often felt I was sat in Skiffs coffee shop eavesdropping on their conversations and as the book unfolds you really are pushed to thinking one way and then another, and then another. There were multiple endings running through my head as I neared the last third of the book which is what you want in a good read. I found this a very engaging and satisfying thriller. I was hooked by the action in the first few pages – Ford creates tension by using a situation many of us are familiar with - road rage; we can place ourselves in this picture, the tension is real. What a great hook! This novel is fast paced, action packed and nothing is as it appears on the surface. The characters are likable, earnest, hardworking and real – this is a community that appears perfect, secure and benign to those looking from out I found this a very engaging and satisfying thriller. I was hooked by the action in the first few pages – Ford creates tension by using a situation many of us are familiar with - road rage; we can place ourselves in this picture, the tension is real. What a great hook! This novel is fast paced, action packed and nothing is as it appears on the surface. The characters are likable, earnest, hardworking and real – this is a community that appears perfect, secure and benign to those looking from outside in. All it takes is one rotten apple and the life blood of community, trust, starts to clot and decay in a spectacular fashion. Everyone has secrets they do not wish to share. I liked that the main character Rennie Carter is a strong, self reliant woman with many hidden talents – some she would prefer to remain hidden – along with her gun! Rennie knows her own mind and takes responsibility for her own actions and safety and is compelled to find her missing partner regardless of what the community or the police may be presuming. This narrative accelerates down a twisting path of lies and assumptions, greed determines the journey and we do not find the truth until the very end. A fantastic, absorbing and fast paced read. This book is best enjoyed in one sitting - but you won’t really have a conscious choice in that once you begin reading you will be hooked and compelled to read until you reach the very last page! This was good story about a girl with a secret past life that she thinks has come back to haunt her and her special man. It was not a really riveting book but it was enjoyable enough as Max's friends look for him after he goes missing. Der Anfang des Buches hat mich richtig gefesselt, denn schon zu Beginn gibt es eine Begegnung, die den Puls in die Höhe treibt. Leider wird diese Spannung dann aber nicht mehr aufrecht gehalten. Für meinen Geschmack trat die Story dann etwas an der Stelle. Zwar erfährt der Thriller, bei denen eine Person spurlos verschwindet, finde ich immer besonders spannend. Das ist auch der Hauptplot dieser Geschichte. Obwohl Rennie und ihr Freund Max eigentlich glücklich sind, ist er auf einmal verschwunden. But that changed the day she drove into the small town on the beautiful Lake Macquarie in NSW. She got a job working in a cafe, she begin to make tentative roads towards friendship Rennie Carter has been in Haven Bay for five years, possibly the longest she’s ever stayed anywhere in her whole life. Previously it’s always been about running, keeping on the move, laying low. Don’t make friends, don’t settle in, don’t get close to people. You never know when you just might have to pack up and leave. I enjoyed this, her third novel, but not as much as number 2. Or maybe I'm just reading too many Jaye Ford books in a row. The book started well but then seemed, at least to me, to take too long to get to the climax of the story. I’ve never been a fan of thrillers. I just don’t have the stomach for blood, gore and gruesome scenes. Don’t let Jaye Ford’s scary titles fool you. Though there is certainly suspense and frightening scenes, Jaye Ford’s books are psychological, character-driven fiction. Her work might be more akin to the ‘cosy mystery’ genre than to the thriller genre as there is very little that is gruesome in her books, and the scenes unfold organically in a way that is very natural and smooth. In Ford's lates I’ve never been a fan of thrillers. I just don’t have the stomach for blood, gore and gruesome scenes. Don’t let Jaye Ford’s scary titles fool you. Though there is certainly suspense and frightening scenes, Jaye Ford’s books are psychological, character-driven fiction. Her work might be more akin to the ‘cosy mystery’ genre than to the thriller genre as there is very little that is gruesome in her books, and the scenes unfold organically in a way that is very natural and smooth. In Ford's latest novel, Blood Secret, the blood doesn’t refer so much to spilled blood, as to the genetic blood – as in blood ties. Rennie Carter has blood secrets, and she keeps them secret for a long time, living her life from day to day, and town to town, until she finds herself settling into life in sleepy Haven Bay with Max Tully. Then one day Max disappears and in Rennie’s attempts to find him, she has to uncover and unmask her own secrets, redefining who she is and what she needs in her life. Rennie Carter and Max Tully have been living together as partners in a small town on the shores of Lake Macquarie for the last 4 years. When they are dressing to go to a friend's 50th birthday party things get steamy and serious between them. With a tense atmosphere in the car, the tension increases when a teenage driver tailgates them in a fit of road ra Jaye Ford has written a very clever and riveting psychological suspense thriller that keeps you enthralled and guessing almost to the very end. Rennie helps out in the kitchen and doesn't catch up with Max much during the party. When she is ready to go home Max cannot be found and nobody saw him leave. Rennie worries that he may have been targeted by the road rager. After a long search Max is still not found and after finding blood in the car park Rennie reluctantly reports him missing to the police. Rumours abound as Max has been known to go away suddenly before. She also hears that Max and his business partner and cousin, James have had a huge row over the finances of their business. Surrounded by supportive friends in the small community, Rennie sets Road rage incidents are always scary - however for Rennie Carter a seemingly 'run of the mill' incident on the way to a party on a Friday night takes on a menacing feel. Rennie has spent her whole life running and can't shake the belief that her past has, yet again, come back to haunt her. Then when her partner Max disappears just a couple of hours later, Rennie knows she can't run and hide this time - she has to stay and fight. Rennie Carter is a survivor with a tragic past who's settled in the seemingly-calm and quiet Haven Bay. Although she's spent most of her life on-the-run, Rennie's now got a job she enjoys, discovered a love of painting, developed friendships and fallen in love with local, Max Tully. It seems she's finally offered a glimpse of happily-ever-after. However, when Max suddenly disappears Rennie's left wondering if her past has caught up with her. With the police offering minimal assistance Rennie has to grudgingly deal with a part of her life she'd prefer to forget. Her own investigation into Max's disappearance however, is complicated by secrets being unearthed about Max's own past and allegations of a double life. As seeds of doubt and suspicion are planted, Rennie starts to question who, in Haven Bay, she can trust. There's a lot simmering beneath the surface from the start of this book. It takes a while but the past is slowly and intricately unravelled and we are ultimately kept guessing until the very end (a good thing in crime fiction!). Blood Secret is also being published by Random House Australia and is available on 2 September 2013. *Ford has also written a novel as Janette Paul, the details of which are also on her website. 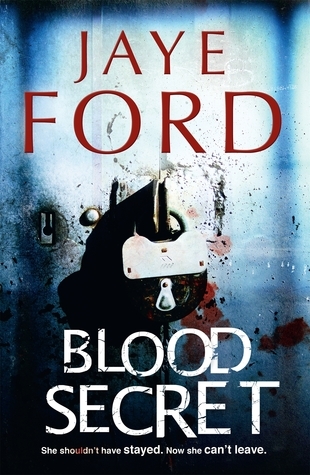 I have discovered that Australian author Jaye Ford has a real knack for writing tense psychological thrillers and Blood Secret is no exception. The reader is kept guessing from the moment they open the book. The book is based around the character Rennie Carter, a woman living in a quiet area called Haven Bay. Very little happens in Haven Bay, but one day Rennie finds her life in disarray as her husband suddenly vanishes without a trace. Rennie is deeply concerned for Max’s whereabouts, believing I have discovered that Australian author Jaye Ford has a real knack for writing tense psychological thrillers and Blood Secret is no exception. The reader is kept guessing from the moment they open the book. The book is based around the character Rennie Carter, a woman living in a quiet area called Haven Bay. Very little happens in Haven Bay, but one day Rennie finds her life in disarray as her husband suddenly vanishes without a trace. Rennie is deeply concerned for Max’s whereabouts, believing his life is in great danger, but she finds herself at odds with both the police and Max’s acquaintances. They suggest to Rennie that Max is not who she thinks he is. Rennie herself is no stranger to leading a double life, changing her name after a violent past, a past she is now worried has come back to hurt her and her family. Blood Secret is the kind of book that is best devoured in a single sitting. It is fast and relentless, the plot action moving quickly for the reader. The book features a great female lead, which I have found after reading three books by this author, is a key feature of Jaye Ford’s books. A solid cast of complex supporting characters and a suspenseful storyline that had me guessing about the characters right up until the end, make Blood Secret a highly recommended read. Rennie Carter had spent her whole life running from a violent past when she arrived in the sleepy town of Haven Bay. Initially planning to stay a short while (as always), she was not prepared for the possibility of falling in love with local man Max. Life with him is so good that finally Rennie puts down some roots and allows herself to live a "normal" life for a while. Despite her contentment Rennie is always on her guard and her instincts smell trouble when she and Max are involved in a road ra Rennie Carter had spent her whole life running from a violent past when she arrived in the sleepy town of Haven Bay. Initially planning to stay a short while (as always), she was not prepared for the possibility of falling in love with local man Max. Life with him is so good that finally Rennie puts down some roots and allows herself to live a "normal" life for a while. Despite her contentment Rennie is always on her guard and her instincts smell trouble when she and Max are involved in a road rage incident one evening. When Max goes missing a mere few hours later Rennie feels her old fears rushing back to grab her by the throat. Fighting her own instincts to run, she sets out to find Max but in the process realises she is not the only one with skeletons in the closet. As is Jaye Ford's style, tension and suspense abound right from the start of Blood Secret. You cannot help but be drawn into the gripping plot, never sure which is a genuine clue or a red herring. Her characters are real to life and three dimensional and her setting a typical Australian small coastal town. This review has been hidden because it contains spoilers. To view it, click here. A must read if you love tense, psychological thrillers. Jaye paces the book with a steady build-up of tension, every page bringing you closer to the climax until you can't read fast enough to try and figure out whodunnit. The main character, Rennie, can't forget her dark past, on the run her whole life from the vicious, vindictive father who killed her mother. When her partner Max, goes missing after a road rage incident, she at first suspects the young hoon. But as time goes by, she begins to th A must read if you love tense, psychological thrillers. Jaye paces the book with a steady build-up of tension, every page bringing you closer to the climax until you can't read fast enough to try and figure out whodunnit. The main character, Rennie, can't forget her dark past, on the run her whole life from the vicious, vindictive father who killed her mother. When her partner Max, goes missing after a road rage incident, she at first suspects the young hoon. But as time goes by, she begins to think her father has surfaced again. Terrifying memories of violence and danger come to the fore and Rennie battles the urge to run as she'd done her whole life. Or does she trust a new set of instincts that are so foreign she'll succumb to self doubt before she can piece together the puzzle that will save the man she loves? Just get it and read it. Like me, you'll be hanging on the edge of every page! This is the first time I have spent such a large amount on an e-book and I must say, the author delivered. Blood Secret starts dramatically and the pace keeps up. Well-crafted and written, the author has created a very likable – if flawed, and aren’t we all? – characters, in whom, the reader can easily invest concern. The tension mounts Rennie tries to understand what has happened to cause Max to disappear in the middle of a party. The arrival of his 14 year old son is a surprised complication in her search for Max. The innuendos and Max’ apparent penchant for disappearing confuse Rennie, who is all too familiar with “disappearing without notice” throughout her life. This book is impossible to put down. As suspicion mounts – and two suspects emerge from the mess – Rennie is forced to face her fears and confront what frightens her most: violence. 2.5 stars. I really can't say why this book didn't do it for me without large spoilers, so I will attempt to use broad strokes. The main character seemed annoying and wooden, and when the villain of the piece was revealed, using his back story and current events left a bad taste in my mouth. The resolution was far too short, and speaking of short, there were 48 chapters, and most of them were only six pages in length, which made the book seem very broken up. Nothing ever happens in Haven Bay. This is why Rennie Carter has stayed longer than she should. But the book opens with Max, her lover disappearing. Could she be the reason Max has gone? Is it foul play or is Max just taking some time out? This book grabs you from the start and never lets go. I love this type of book, especially when the possibilities keep changing. I did not predict the eventual outcome, but have gone looking for the other titles written by this author. Wow! I'm pleased to say that Ford's writing and plotting have improved out of sight since her debut, Beyond Fear. Despite the fact that savvy character, Rennie, completely ignored a possible suspect until it was almost too late, this is nevertheless a gripping read. It doesn't have the finesse and twists of Gone Girl, but I believe Ford will get there. Disappointing. Three is generous, more of a 2.5. Interesting it was but definitely not the nail-biting suspense touted in various reviews. The road rage incident was promising and suspenseful but not the rest, including the climax with the, to me, obvious villain. I would read another by this author though. I found the first part of the story a little slow, however it did establish the characters and their backgrounds well. This is her third book, set north of Sydney she sets up a tense stand off with a road rage guy and then the focus of the rage goes missing. Behind this is his girlfriend's (who we follow) history which unfolds as increasingly unattractive, but also some of the man’s past and where that might fit in. After the early tension it is mostly predictable but a good light read. I have read all of Jaye's books now and would have to say I enjoyed this one the most. Twists and turns were great. Won't say too much coz I don't want to give away any secrets!! Get your copy and read it NOW!!! She has a Jaye was born in Sydney in 1963 and grew up on the Northern Beaches before studying Communications in Bathurst, NSW.